This morning, when I woke up refreshed, thanks to an extra hour in bed, and it was nice and light, the clocks changing did not seem such a bad idea. But by 5, when it was dark, and miserable.. suddenly it seems winter is upon us. I think we have been fooled, by hot weather earlier this month, the fact I am still picking tomatoes, into forgetting how late in the year it is. And now suddenly reminded. And I have not considered getting ready for thingymas at all. So a start. Home produced is slow. I must consider the liqueur stocks and make some more beer. And a ham. But this weekend we did make the mincemeat, and four huge jars now lurk boozily in the fridge. We also processed more pork, making a mountain of minced pork and sausagemeat – some of the later now labelled for use for thingymas – for making chestnut stuffing and pigs in blankets. Today, a sunshiney day, became apple juice day. The sweet apples I shook out of the tree a while ago have been lurking in the freezer, and they were thawed crushed and pressed. We made 15 litres of juice. Some is already on it’s way to cider, whilst the rest frozen to be drunk as juice. This year the apples were very rosy in colour, and the juice is pinky too. We got sticky, we attracted wasps, and we got tired too, but a rewarding time and delicious juice to drink while we did it. that wassailing earlier in the year clearly paid off! lots of fruit coming in now, so I can spare some for the rumptopf – 200g of cherries, and 200g of victoria plums – with 200g of sugar and a slosh of dark rum. The pears are ripe, and falling from the tree, so time to pick and ripen them – and I think there will be plenty for the rumptopf too – our pear tree appears to be biannual, but on its fruiting year, it makes up for lost time. Early for apples too, and many are small, but rosy and ripe, and we have already been gathering windfalls – time to think about picking them too – a friend tells me you can’t pick them before October and they wont keep if you do… but I find they keep long enough for me to process them into the freezer and the certainly dont keep if they rot on the ground or the sheep get to them first! A few weeks ago, I came across a rumtopf pot in a charity shop. I’d been keeping an eye out for one, and there it was in an unobjectionable colour for £1.50 (bargain when you compare to prices on ebay). I have a feeling people only ever make a rumtopf once – whether this is because the results are not good, it was a present that they felt obliged to try, or the hangover too painful to repeat, I have not established, so in the interests of research, I am obliged to give it a go. Besides I like liqueurs and this ia another way to store fruit without using up freezer space. The idea is you layer fruit in the pot as it comes into season, along with sugar and rum, starting in June with strawberries, and eating the boozy fruit and drinking the resulting liquor come thingymas. And now it is June (already?!) and I have strawberries.. time to start. So I shall keep a little record of what has gone in – on the off-chance it is actually nice, I shall want to repeat it. So far 400g of strawberries, hulled, 200g of white sugar and a bottle (70cl) of cheap dark rum. It’s a good year for elderberries – surprising given how we tried to have all of the flowers earlier in the year as fritters, champagne and cordial, but still the elder is laden with berries. We picked few kilos and I now have two gallons of apple and elderberry wine on the go. What to do with the rest?. I did have a go at making an elderberry rob – apparently a cold cure – but it really wasn’t that special, and unfortunately came at the same time as strong competition: we had just made a load of freezer-space giving blackcurrants into home made ribena- by following the recipe in the river cottage preserves book, and it was wonderful – well the rob was lame by comparison and went by the wayside after that. That and it set in the bottles…. So – I decided to try pontack sauce. It seems to be raved over, and mutterings of how it is best stored for seven years and the like. Again, I followed the recipe in the river cottage book. It’s erm… strange, interesting, odd.. I’m not sure about it. Maybe those seven years are a requirement? We have picked most of our apples now – and a good crop it is appearing to be – early again though – and they say they don’t keep if picked early – however, if they are ripe, they wont keep if we don’t pick them either. So they are in the cold shed – freshly cleared out due to recent shed manoeuvres, and we are hoping they will keep for a while – at least until we have the pigs back and in the freezer, and then we shall know the true extent of the freezer crisis ™. Hopefully then we shall be able to freeze some apples. 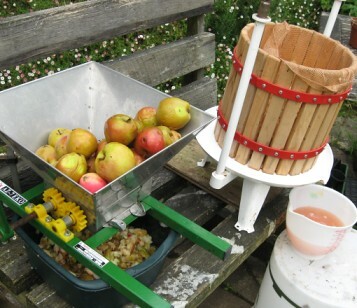 Meanwhile – we are cooking appley things, and have juiced some for drinking – freshly pressed sweet apple juice is wonderful. 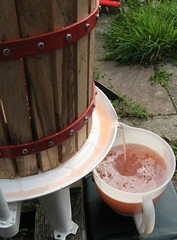 Some of the pressed bramley juice is now in demijohns with sugar and water, to be made into wine. Oh woe is me. I have to make wine due to lack of freezer space…!